A bread machine is a modern home appliance for making bread. It lets you have freshly baked bread in your home without having to personally knead the dough or wait for the dough to rise. It consists of programmable settings and a bread pan. Depending on how advanced the bread machine is, it may consist of other features, such as LED view, keep warm feature, audible tone, and others. 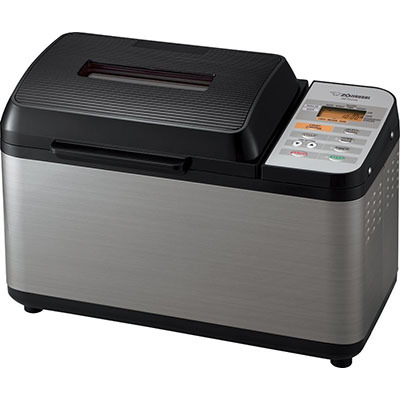 Match up your minimalist kitchen with this simple yet elegant Hamilton Beach Homebaker 29882 Breadmaker. It helps you prepare healthy whole grain breads, sour dough, white breads, and more, and control the nutritional content of your bread. Using it is as easy as ABC with its 3 easy steps: add ingredients, select cycle, and start. It has 12 cycles that include the processing of jam and cakes. So in addition to breads, Hamilton Beach Homebaker 29882 bread maker also processes pizza dough, flatbreads, croissants, and others. Accompanying the package is a gluten free French bread recipe so you can jumpstart your healthy bread lifestyle. 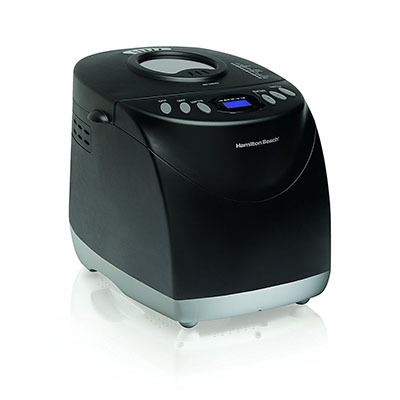 Wow your family with Hamilton Beach Homebaker 29882 Bread Maker’s unique and compact design and versatile performance. It has easy to use bread making technology with just three easy steps. It includes a wholegrain recipe book to guide you through the beginning stage of healthy bread baking. Its other features include non stick pan, cool touch body, extra kneading paddle, and crust color control. Make healthy bread for the whole family as well because it can accommodate up to 2 pounds of loaf. 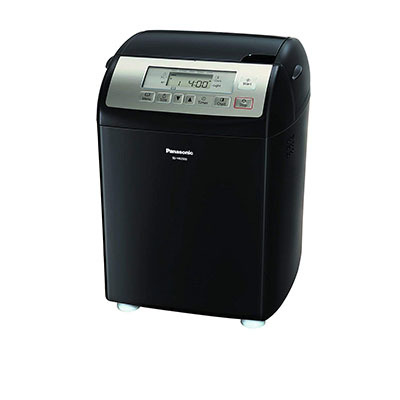 Panasonic SD-YR2500 is another black in color and sturdy gluten free bread machine. It has smart dispensers that automatically release and distribute yeast, raisins, and nuts so you don’t have to do it yourself. It has 8 menu options with gluten free mode and an automatic 13 hour timer. Customize your bread size with medium or extra large loaf size options, and light or dark crust color setting. Healthy bread making is simple with intuitive modern touch pad controls and a large LCD view. Enjoy freshly baked healthy gluten free bread with Panasonic SD-YR2500 bread machine! It may be bulky in sight, but has a sturdy beautiful black finish that can complement your kitchen’s design. On making healthy breads, this Panasonic model has a gluten free mode, crust color setting, loaf size option, and 13 hour timer. Give it a try and improve your lifestyle with freshly baked gluten free breads! Bake a large traditional rectangular shaped two pound loaf with gluten free and custom menu settings for healthier gluten free and organic breads for the whole family. Zojirushi will help you achieve it. With its large traditional rectangular design and dual kneading paddle blades, organic and other ingredients will be thoroughly processed. You can also have oven fresh breads with its quick baking cycle as instantly as two hours. To complement the package, Zojirushi BB-PAC20 comes with a measuring cup and measuring spoon. If you want to thoroughly process wheat and other organic, the Zojirushi BB-PAC20 bread machine is a smart buy. Its dual kneading blades thoroughly process grains resulting to less course texture. The finished bread is shaped to large traditional rectangular size that can feed the whole family. Gluten free breads are always healthy. Gluten-free flours include almond flour, brown and white rice flour, corn bran, rice polish, potato starch flour, soy flour, tapioca starch, polenta meal, cornstarch, and more. These are commonly used gluten free flours for baking gluten free breads. Beat eggs well before adding them with other ingredients. It is acceptable that the yeast may be cold. But, for the rest of the other ingredients, they should be at room temperature. To make the bread last longer, add a teaspoon of cider vinegar in the bread recipe. 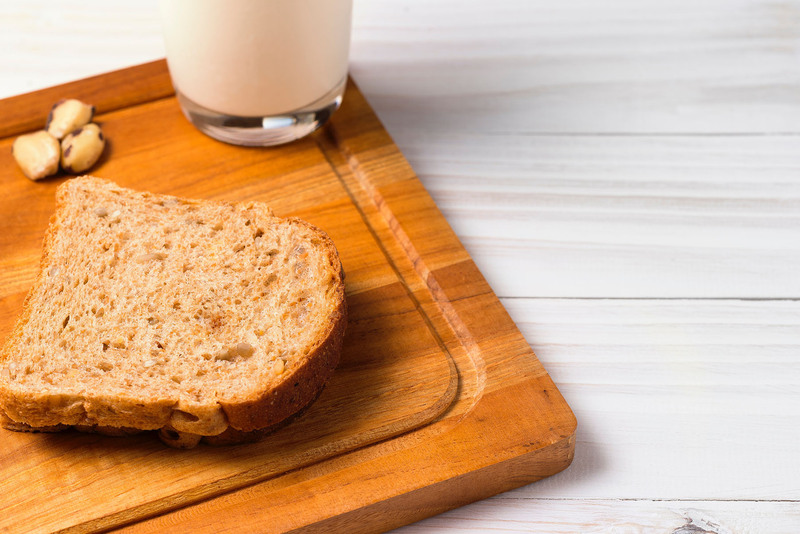 Removing milk from the bread recipe completely changes the taste and texture of the bread which is still delicious. The humidity of the environment while working on the dough, the type of flour, and the brand of flour influence the amount of water needed for the right consistency of the dough. Slice the cooled bread to keep them fresh and ready for use. Wrap the bread slices with aluminum foil, put them in a bag, and freeze. For those who love making their own bread, there are plenty of perks to be found. Home made goods taste delicious, it’s often healthier than store-bought versions, it’s cheaper (thanks to buying baking ingredients in bulk). And of course, there’s the added satisfaction of creating something yourself. But what happens after the baking has been done? When the proceeds have certainly been found, but there’s still a leftover mess? Here, the kitchen is likely a semi disaster, and over time, your bread maker has developed a layer of filth that even elbow grease has a hard time eliminating. To help remedy this unsightly side effect of home baking, try these simple tips to help get you through the cooked-on grime. Why spend extra dollars on chemicals that cause harsh fumes? Believe it or not, some of the best cleaning ingredients can already be found in your cupboards – and they’ll cut the cleaning supplies budget way down. By mixing baking soda and white vinegar, virtually any type of grease and dirt can be bested. Start by sprinkling baking soda on the dirty area, then spritz with vinegar and let the two get to work. The soda will bubble, breaking up thick dirt in the process. Then, once the bubbling has stopped, wipe up with a wet rag. Repeat if needed – although this is only necessary in serious cases. Add a little lemon to offset the harsh vinegar scent. And for water or grease spots, use the lemon directly. Just cut in half and scrub directly on the necessary area. The longer a mess is allowed to sit – especially when there’s heat involved – the harder it will be to clean. By attacking these little messes while it’s fresh, your job will be much easier in the long run. After all, when it comes to your bread maker, it’s important to keep it in tip-top working order, lest the bread itself fall victim. Next time you bake up your signature loafs, remember to follow these easy and effective cleaning solutions. Gluten free breads? No worries because gluten free bread machines are now here! Make healthy wholegrain breads for the whole family and reap its health benefits. Choosing the best gluten free bread machine depends on your bread making priorities, budget, and personal preferences. 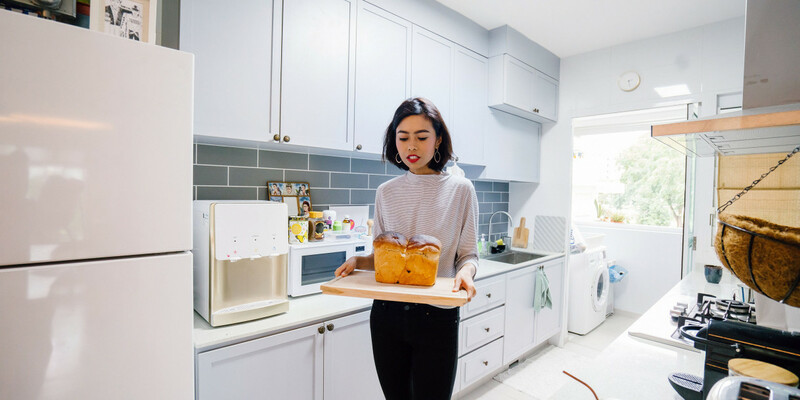 All of the three bread machines – the elegant Hamilton Beach Homebaker 29882 breadmaker, Panasonic SD-YR2500, and the Zojirushi BB-PAC20 – are perfect definitions of gluten free bread machines. They all have gluten free mode which can process gluten and other organic ingredients. One thing that each of the three bread machines lack is the transparent view where you can see how bread processing inside is done. Panasonic has less impressive features, but it is sturdy enough to last up to few years of continuous use. The Hamilton Beach Homebaker 29882 Breadmaker stands out among the three gluten free bread machine because of its features that the other two don’t have. It is easy to use with just three steps and includes extra kneading paddle for more thorough wholewheat and other organic ingredient processing. It has a cool touch body so even when kids are around or even you, it will be safe and burn free. Its other exceptional features include non slip feet, whole grain recipe book, non stick pan, 2 pound load capacity, and more. With these three best gluten free bread machines, choosing for the best is hard. Each of them makes healthy gluten free breads freshly delivered right on your table. You can even add fruits, nuts and other ingredients that can make your wholegrain breads more delicious and more aromatic. Even kids who are not fond of whole-grains will love these types of bread if you add their favorite fruits and nuts. Perfect for the whole family, gluten free machines are also smart investments and can save you money in the long run.